In a never ending journey to dive enlightenment, CFD would like to roll out a new feature spotlighting people that have played an important role in the California diving community but for some reason are nearly forgotten by contemporary divers. They were educators, pioneers, and leaders. Meet Dr. Wheeler North, a graduate of Scripp’s Institution of Oceanography and for over 40 years the premier expert on California’s kelp ecosystems. Working for Cal Tech, Dr. North developed kelp forest replenishment techniques that remain relevant to this day as plans are in motion to restore the beds off Palos Verdes. 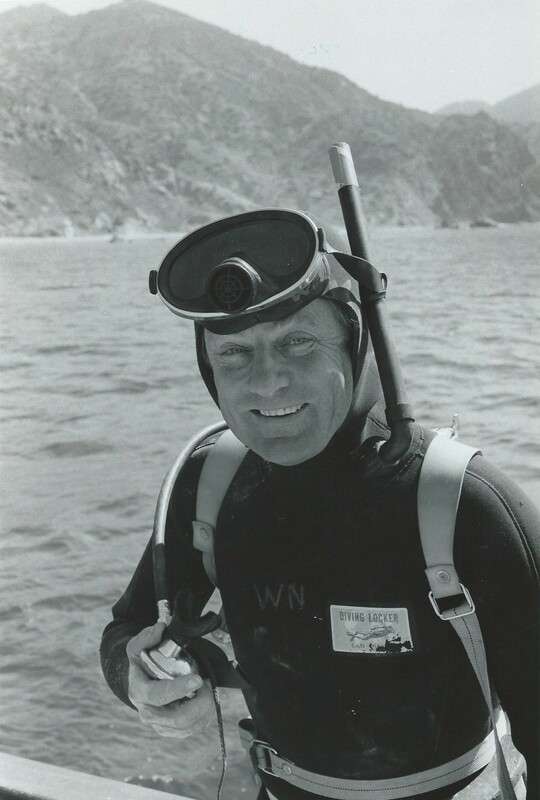 He was also a pioneer in the field of dive training, working with Conrad Limbaugh, Bev Morgan, and Al Tillman during the development the Los Angeles County dive program, precursor to all other dive training programs. In addition, he is widely credited with being the first marine scientist to utilize scuba equipment for research purposes. He also worked on groundbreaking research on biomass fuel and CO2 sequestration. Based on all he did, it is also most likely he didn’t sleep either. In short, an amazing career that impacted and continues to impact our diving community on a regular basis. In recognition, So Cal Edison named the largest man-made reef in California the Wheeler J North reef. Find out more about it here.